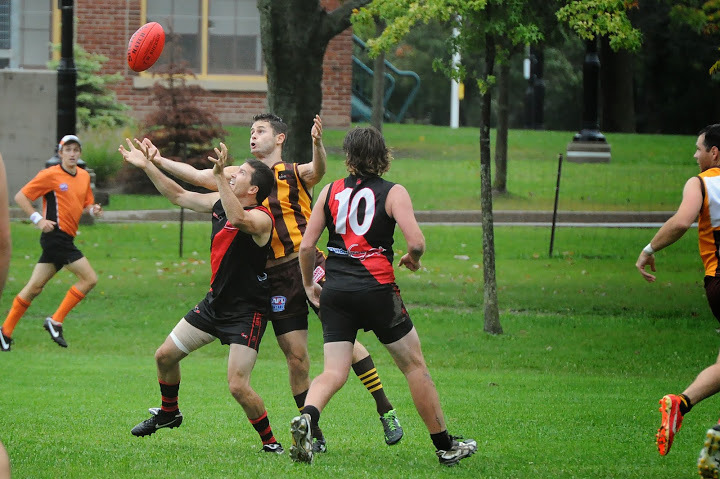 A torrential downpour greeted the Dingos and the Hawks as they arrived at Humber South for the final game of the 2013 AFL Ontario season. It was unclear whether the rain was to either team’s advantage, but it was certain that the match would be tightly contested and skills would not be at their peak. After a big loss in the qualifying final and a hard fought preliminary final victory over the Toronto Rebels, the Dingos knew that they had to step up their game if they were going to snare their first flag since 2005. Being one of only two teams to defeat the Hawks in 2013, the red and black entered the game with a strong belief that they could cause an upset. The Hawks had other ideas, though, as they had cruised into the Grand Final full of confidence having won their qualifying and preliminary finals by an average of 70 points. The first bounce saw the Hawks win the ball out of the midfield quickly before the Dingos half back line, led by Shaun McKay, drove the ball forward into the red and black’s attacking half. Rookie Camilo Serpa was lively early, setting up Craig Stewart for the first two goals of the match as the Dingos jumped to an early lead. The Hawks rebounded, though, with goals to Mario Pareja and Nathan Cragg ensuring that they only trailed by one point at the quarter time siren. Happy with their first quarter, the Dingos entered the second looking to maintain the pressure and intensity that they had started the match with. The Hawks, though, gained the lead early through Shuttleworth and from there they never looked back. Two more goals to one saw the Hawks hold an 11-point lead at half time. The third quarter was the Dingos’ downfall, as they failed to register a major tally and allowed the Hawks to open up a commanding lead. Conor Dullard, who had been well held in the first half by Max Parish, kicked his first of the day from a tight angle and the margin had blown out to 21-points. At three quarter time, the Dingos knew that they were still in the contest, but it was essential for them to start the final quarter strongly. The ball was won out of the midfield quickly and Craig Stewart’s third goal of the day within the opening minute saw the margin reduced to 15-points. At the ensuing centre bounce, the Dingos again won the ball out of the midfield and drove it into their forward line, but could only register a behind. The Hawks were able to rebound and kick a steadying goal through Shuttleworth, and the Dingos found themselves right back where they started the quarter. The Hawks managed to add a couple of late goals to their total and cruised to their first premiership in club history. For the Dingos it will be a long offseason thinking about what could have been, but there is no doubt that they will work hard to ensure that they come back stronger in 2014 and ready for another tilt at the flag.